The labyrinthine streets of Barcelona’s Old City hold many secrets behind their historic doors; and despite the onslaught of tourism in the area there still remain some wonderful spaces to be discovered. 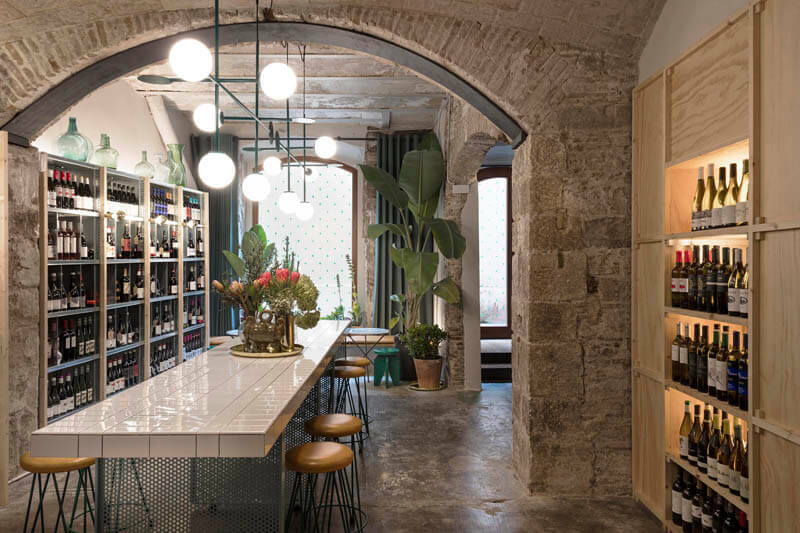 Agüita is one, a small but perfectly formed wine bar and shop designed by the Rodrigo Izquierdo Design Studio accommodated under the stone vaults of the Born neighbourhood. 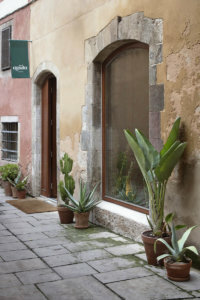 Formerly a storage space Agüita opened in 2017, a joint project by the owners who are both sommeliers, aimed at communicating the stories behind the wines and distilled alcohols on sale there. The space which measures 63 sq.m. 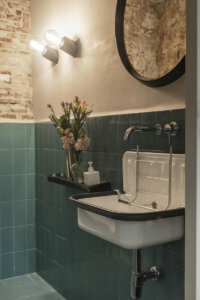 is lined with bespoke shelving units made from a standard system that has been adapted, and provided with decorative lighting, overhead the stone vaults have been cleaned and restored with reinforcement added to the connecting arch between the two formerly separate areas. 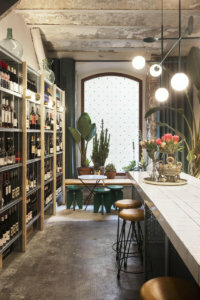 It was decided to maintain as many of the original elements as possible to keep the air of an authentic bodega within the Born, including the flooring, original stone walls and roof. 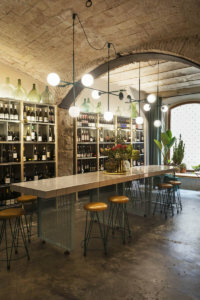 The main furniture element is the central table clad with white ceramic tiles, supported on metal mesh planes, configured as two aligned rectangular surfaces for serving wine with high metal stools and a custom made lighting installation above. Small tables and low stools are placed at the large arched picture window on the opposite side to the main entrance from C/ de la Volta d’en Colomines with banquette seating covered in leather. Glass jars and containers are used to decorate. All furniture was designed by Rodrigo Izquierdo inspired by practical considerations and referencing the world of wine. 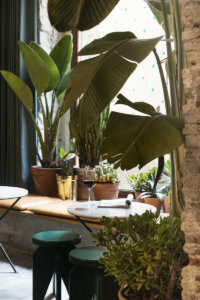 The result is a warm and calming space where the found colour scheme is complimented by a selection of green tones and lush potted plants that contribute to the ambience of wellbeing.